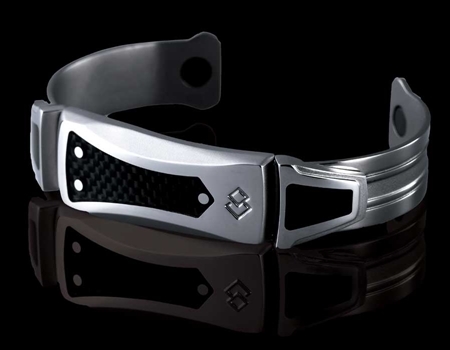 I was wondering if you'd heard of the appearance of some pseudosciencey Power Balance-esque magnetic bracelets in the new Avengers movie - and that the bracelets are actually for sale for $200 (! ), endorsed by Paramount and Marvel Comics. I first read about this on a Hijinks Ensue comment post. As a fellow skeptic and longtime reader of your blog, I thought I'd alert you to this scummy product placement. Yep, the Limited Edition Colantotte Magtitan Neo Legend really does seem to combine five forms of pseudoscience, doesn't it? It's not at all like the admittedly worthless Power Balance wristband, though. Power Balance and similar "hologram" or "ionised" bracelets don't have any identifiable physical properties, or effect on users, that a non-"energy"-enhancing silicone rubber wristband doesn't have, as long of course as the user believes their bracelet is special. But the Magtitan Whatever Edition has magnets in it. And, as we all know, magnets can do anything. This is sort of like the problem with debunking psychics, where the true believers say "OK, Mr A proved to be a fake, but Ms B must be genuine! ", and then move on to Mr C, Ms D and so on as each new prospect is debunked until the skeptics run out of un-wristband-enhanced energy. Nobody can ever prove that every single "quantum" talisman, psychotronic money magnet, mobile-phone antenna-booster sticker, ultrasonic mosquito repeller, magic electricity saver or miraculous fuel additive is a scam, so chronic credophiles always have a new thing to believe in. And finding a new thing to believe in takes a lot less time than proving the thing doesn't work. I agree that this product placement is weird, though. You'd think it'd be counterproductive. "Do you find it entirely plausible that part of the Hulk's transformation invariably includes the manifestation of a pair of indestructible purple pants? Have you never wondered how Tony Stark can pull hundreds of gees and take hits like Superman without ever being turned to red chunky salsa inside his armour? Then do we have a health product for you!" « "MY COM-PO-NENTS ARE FUL-LY COM-PAT-I-BLE WITH LE-GO!"